Summer, a season that everybody around the world loves. It’s warm, sunny and comfortable outside. The waters have warmed up to a certain degree where all kinds of species of fish feel at home, and the activity level of the predators is in full force, and feeding mode is on. Everywhere vegetation is at it’s highest density of the year, and where baitfish find shelter, the Pike roams on the edges of the weed lines. 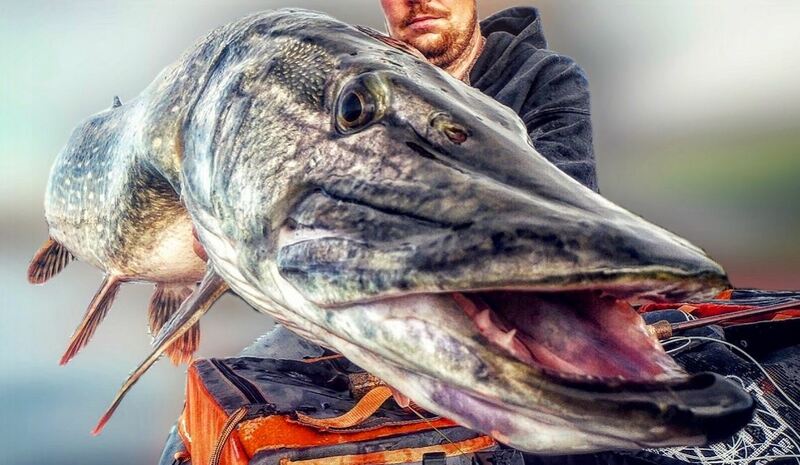 You guessed it right, It’s Pike on the fly time! When you say fly-fishing, there are a lot of different ways to approach any body of water. Either from shore, a boat, kayak or the float tube. The last one has become my absolute favorite when it comes to this style of fishing. You are mobile, can go anywhere you like, and above all, are free on the water, close to the fish and one with nature. It doesn’t get any better right? When fly fishing from the tube, I often travel a far distance on the water. 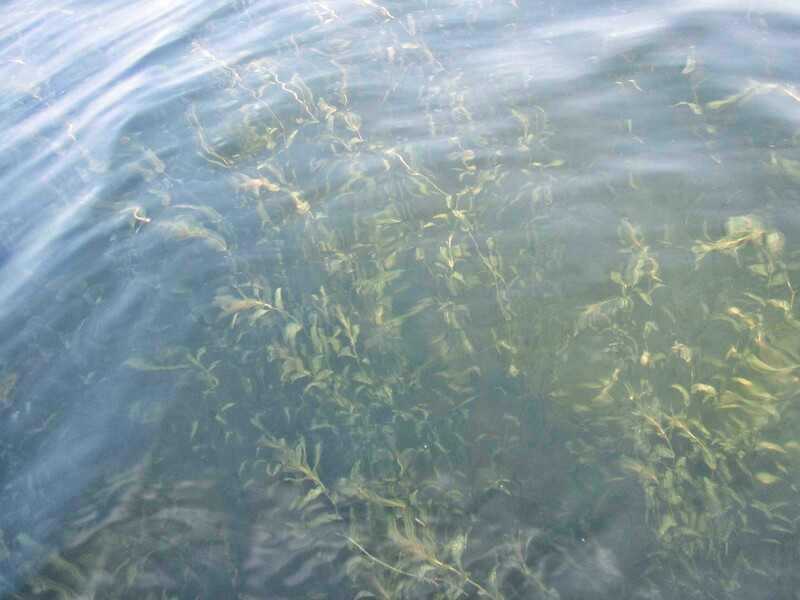 In Summer, it’s key to cover as much water as you can in order to find the fish you desire. Another aspect of this style of fishing is that you’ll need to be safe on the water. 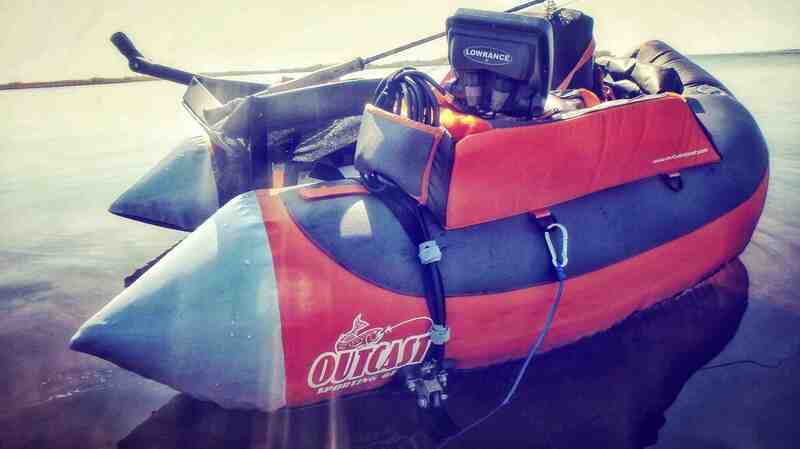 Therefore I use a high quality and large float tube, called the Outcast Super Fat Cat. This float tube enables me to fish a radius of around 3 miles a day and has opened many new possibilities. It enables me to silently approach the vegetation predators such as the Pike like to hide in and has given me some incredible results out on the waters I fish in. 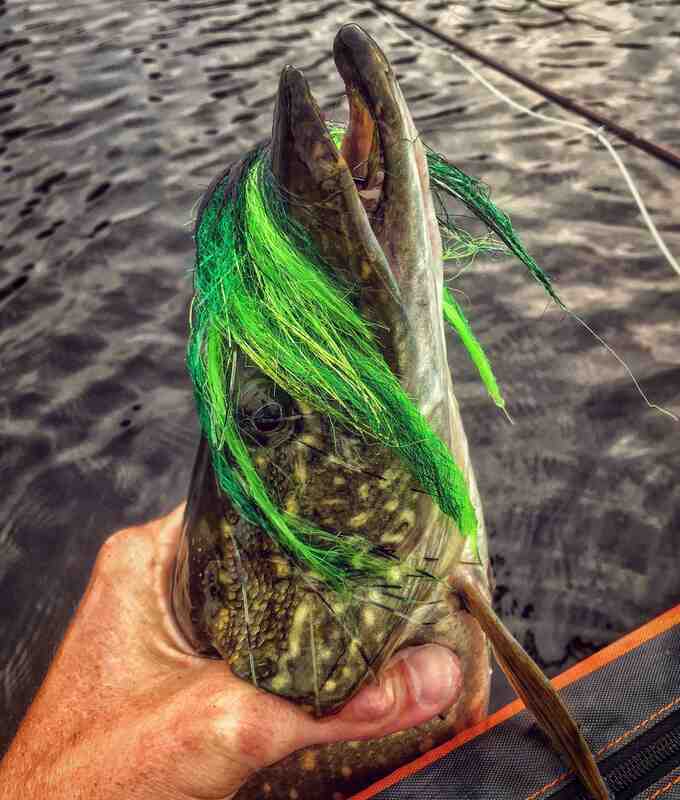 Pike on the fly in Summer is all about speed. The fish are keyed into looking for the fast-moving baitballs in the water, and fishing on a fast phase is a must this time of year. Because the Pike is keyed into smaller prey, somewhat smaller flies are used. Anything around 8 inches works best, though the visibility factor can be a real game changer. Every different body of water holds a specific watercolor in the Summer due to the density of the algae bloom, so choosing the right profile is essential. Due to the fact that you need to fish fast, synthetic flies are used. While retrieving the fly back to you, a faster stripping technique is used, with pauses included to make the fly jig up and down. The soft fibers of the fly will glide and move through the water, and the jigging action has proven to be irresistible to bigger fish. The PikeSkinz fibers from Jerkbaitmania have quickly become my absolute favorite. The fibers enable me to tie a relatively bulky fly, that moves freely in the water but can be cast far out due to their slim body profile once it goes up into the air for another cast. The fly in the picture above is a perfect example of that. 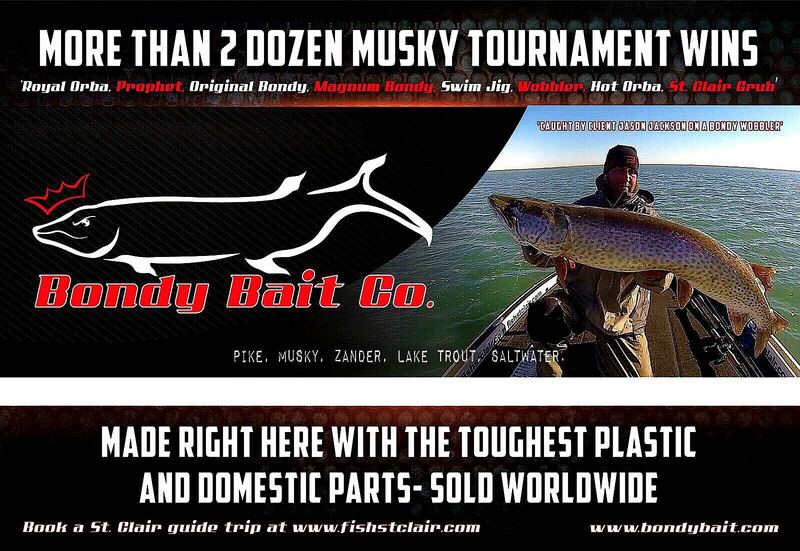 It has a darker silhouette in the water, but the actual fibers have the same glitter and shine as a real baitfish and a great action in the water. Another few favorite colors to use are Dark Esox / Lime Green, Red Head, Dark Blue / White glitter, Black / Orange and Tan brown. Some natural and a few shocking colors in order to match any type of situation when being out. Another highly important factor is the choice of your leader. Not the bite guard, but what connects the fly-line to it. Because you are often fishing in sunny conditions this is an essential part of your setup. 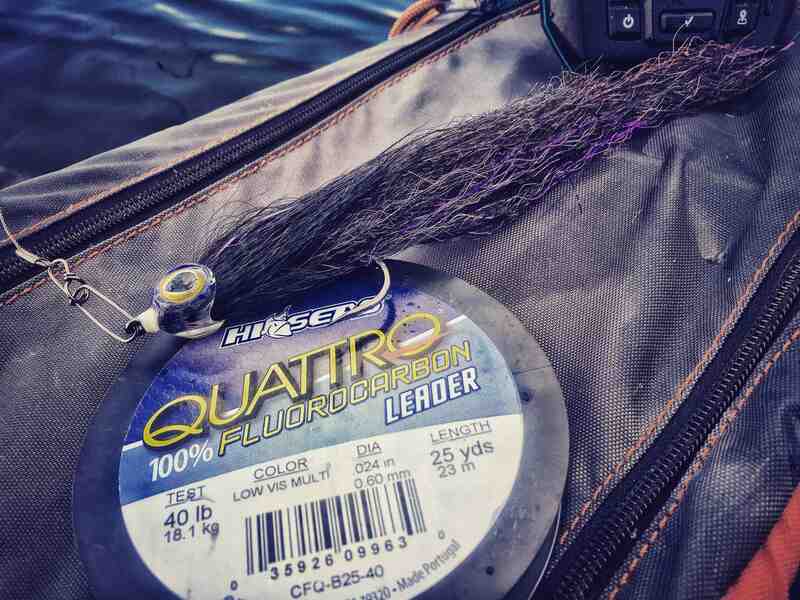 In the past, I would have used mono, but these days there is a type of fluorocarbon on the market called ”Quattro Fluorocarbon”. It’s made by Hi-Seas and true quality. Besides the fact that this material is abrasion proof, which is a must when fishing around high-density weedy vegetation, it’s also super strong, and above all specifically colored. 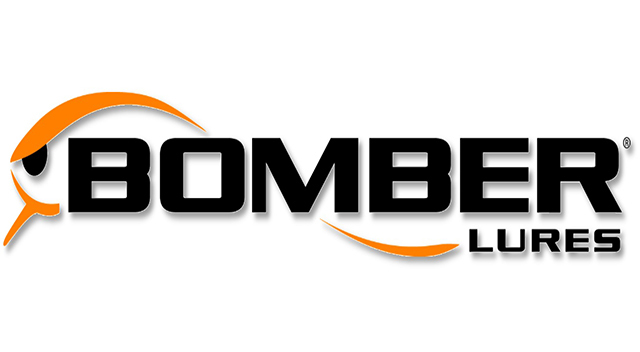 In fact, it is a 4-color camo technology with fluorocarbon line. The unique coloring process does for fishing line what camouflage clothes do for the predator, It basically breaks up visual patterns making the line blend into its surroundings. Four scientifically selected colors are alternated along the fluorocarbon reducing light transmission and creating a whole new level of invisibility. The line is smooth and supple and great to use for wary fish. Regarding the choice of fly-line, I like to refer to the fished depth. Remember that most of the fish stand close to shallow water this time of year, and therefore it’s not needed to fish deep. 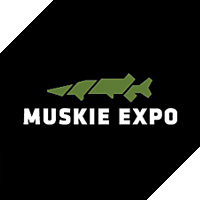 When your fly is noticed by the Esox, they will come up and grab it anyway, so an intermediate of moderately slow sinking line is perfect for the job. Due to the fact that in Summer the water temperature is warmer the fish are extremely active. It’s not uncommon they come up to grab your fly from the deep. Even when the water is 30 feet or more, a fly fished at let’s say 7 feet will become a target. 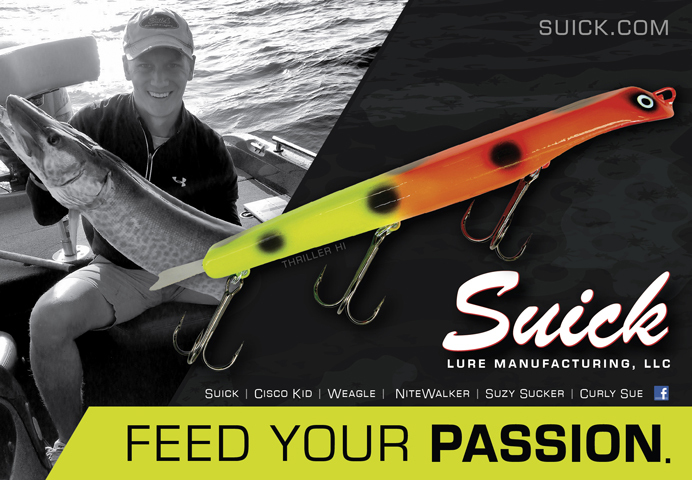 My most favorite line to tackle all conditions is the Scientific Angler Sonar Titan Full Intermediate. This fly-line with a sink rate of 1.25ips gets your fly down into weeds on the best sinking speed, but also enables you to fish a dead slow fall above deeper water and stay in the striking range as long as you desire. Most intermediates or slow sinking fly-lines get down head first. This means the belly of your fly-line goes deeper than the rest of the line, which is something you don’t want. You want a line that sinks evenly and horizontal to the deeper layers of the water. 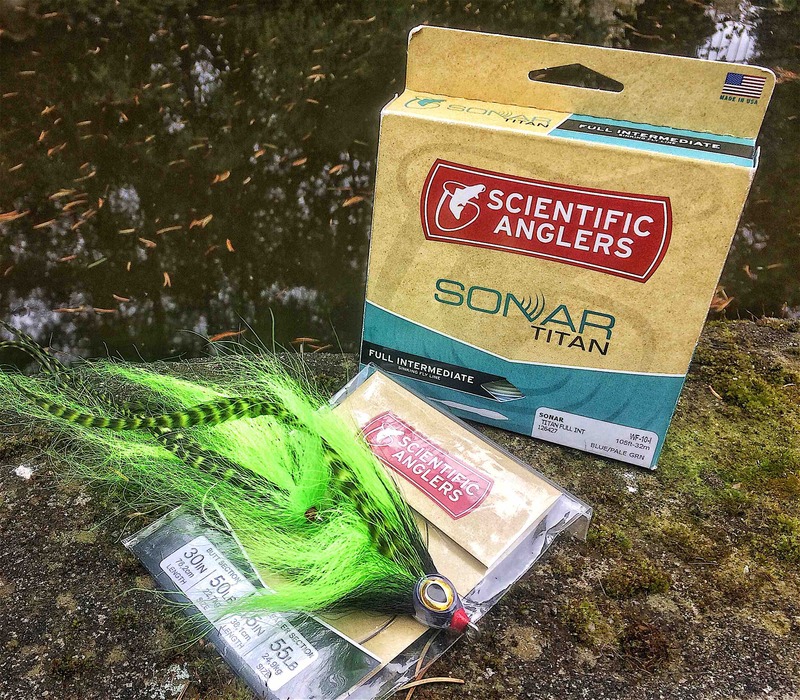 Scientific Anglers Sonar Titan lines are the Only fly-lines out there that carry these specifications and therefore are just about perfect for the job. If you have never used one, you’re really missing out! And last but not least the type of rod and reel combo that is used to fight the big fish that grab your fly. When fishing any large body of water I personally prefer a heavy setup. Rods from WF10 all the way up. 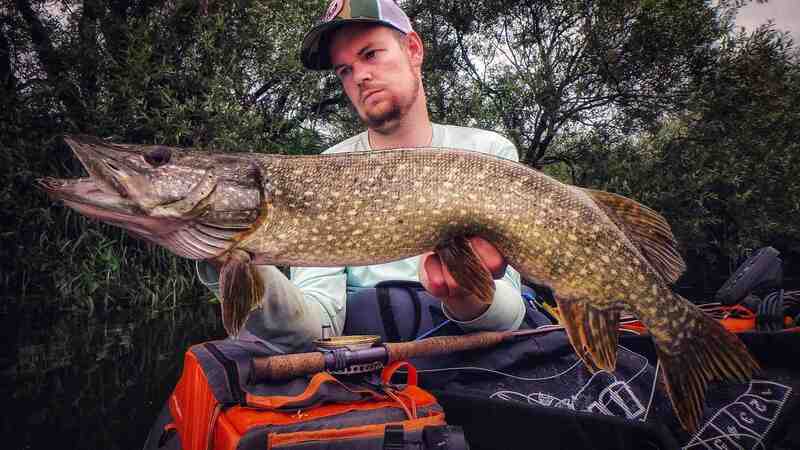 Big Pike is very aggressive in Summer, but also water temperatures are high, and therefore need to be fought as tight as possible. Also, the takes are rock hard and you’ll need a heavy rod to set the hook. 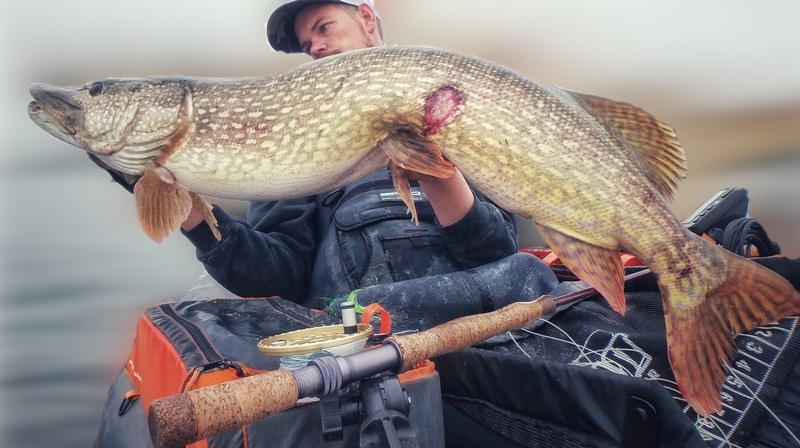 All-Big Pike on the fly fights takes place on the line. Some people might be wary about this, but when fishing close to dense vegetation fighting big fish on the reel is a no go. I want to be able to control the tension and when the fish dives deep into the weeds and just sit there, fighting them on a reel will often result in a loss. Especially when they suddenly swim loose and come back at you, being able to jump in fast and strip in any excess line will save you from potentially losing that Monster fish. All in all fly-fishing for Summer Pike is a game of time and place. Being there when the action happens at the right time. Before heading out, carefully plan your time on the water how it’s going to be, and how you want it to be. No matter when or where you are going out, make sure you have a plan ready and stick to it. Even when the conditions are not what you would expect them to be, stick to the key elements and keep at it no matter what. A different approach can and will make or break your day. The season this year of 2018 has been super tough and slow due to the consistently hot weather and climbing and falling temperatures and it’s not an easy game. All days are different, and it’s constantly adapting to the circumstances when it comes to fishing, but in the end, it’s all worth it. I had some crazy sessions just because I made a plan and went for it. The fish below as a result of that. But of course, it wasn’t the only one and thanks to the plans I made, it was paying off big time for me. Even on dead slow days. 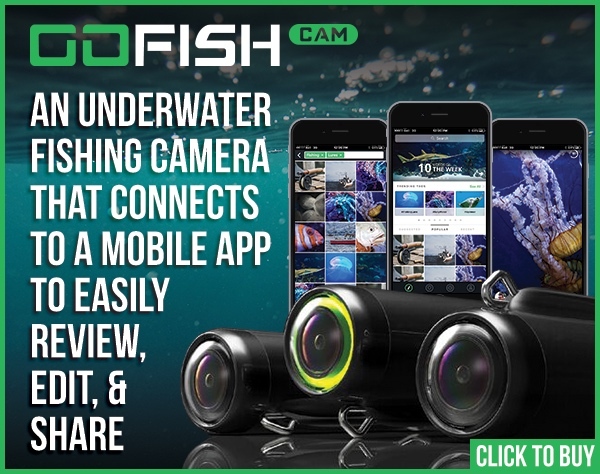 So next time you’re going out, make sure you are all set and ready to go, your next fish can be a real Monster!